Before artists had ample opportunity for travel, their styles were usually associated with specific regions, towns or royal courts. 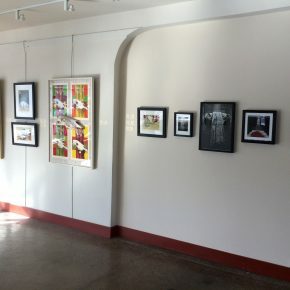 As a new exhibit of printmakers in Spring City suggests, Sanpete County continues, in a way, this sort of regional identity, with many of these works by area printmakers revealing stylistic and thematic resemblances; but there is pleasant variety on display as well, with prints that technically range from lithographs to woodcuts and thematically from the simple to the surreal. One style on display here is that (as yet) unnamed but popular school of Utah art that is flat, figural and frequently domestic. Lee Udall Bennion and Kathy Peterson are two of the better-known practitioners of the style (Brian Kershisnik is perhaps the best known). 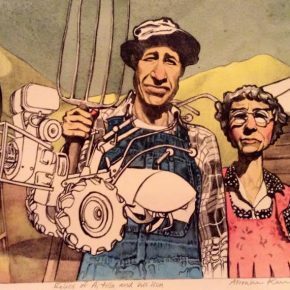 Both live in Sanpete and each displays here etchings/aquatints that reflect in a different medium the aesthetic qualities that have made their paintings well-loved and in high demand. A pair of Peterson’s etchings, in which Pacific Islander women fill the frame, appear beguilingly simple, but the patterns in the women’s dresses and in the foliage surrounding “Malia” create dynamic forces that push and pull the seemingly flat surfaces carved out by Peterson’s elegant line. In the pair of etchings that depict female readers, her line is less sensual and the patterns more uniform, achieving a more subdued and stately if less exciting effect. 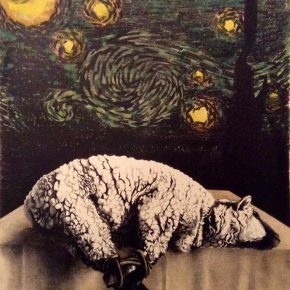 This handful of etchings is rounded out by a horizontal view of five sheep in a nondescript, chiaroscuro setting, a work in which Peterson shows her skills at creating dynamic works with reduced means, even when depicting the ubiquitous fauna of the region. 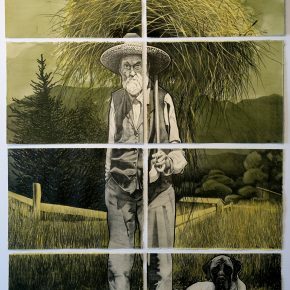 Bennion’s engravings, done in 2013 and accentuated with watercolor, display two of her cherished subjects: her horses and her children. “The Bath” is a delightful etching in which the study in contrasts, between the straight lines of the wainscoting and the curving lines of a sloping shoulder and freestanding tub, serve to guide the viewer’s attention to the finely wrought detail in the bather’s splayed fingers. The subject is presumably Adah, the artist’s daughter and frequent model, who also appears in “Adah @ 21,” framed by gladiolas and looking wistful, and in “Horse Girls,” lovingly caressing two horses. The mother’s model has become an artist in her own right, evidenced here by four woodblock prints. It is intriguing to see the model so often depicted by her mother now depicting herself in a work like “Self at 26.” The similarities are apparent—the flat frontal look, the engaging gaze, a penchant for patterns and pets—but the daughter’s indebtedness to Art Nouveau, to which the mother’s work is related though more distantly, is evident—especially in her “Measuring,” where the subject’s flowing tresses, about to be cut, form a half moon around her body. Though once common, it is rare these days to see artistic lineages follow such genetic lines. More often we see artistic DNA passed from teacher to pupil, an artist’s alma mater frequently evident in their postgraduate work. 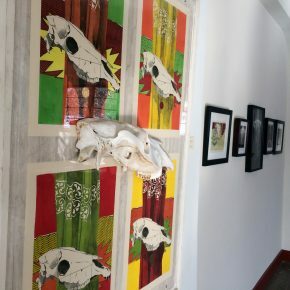 Snow College Professor Adam Larsen’s woodcuts are immediately recognizable, both for their striking graphic quality and for their inventive narrative play, and they must be a tempting source for students to copy when working out their own artistic chops. He likes blending a nostalgic style (his prints frequently have a carnival quality to them, something out of the ‘30s and ’40s) with visuals that are driven by the wordplay of his titles. They can be disarmingly cute even when the issues they explore are multilayered and difficult. 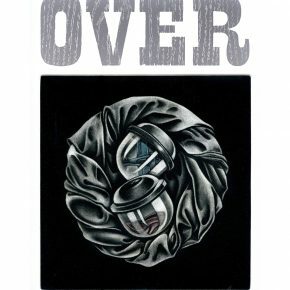 In one print on display, the adverbial part of the title “Overprotective” becomes a preposition when it is placed above a mezzotint image of nestlike folds of cloth enwrapping two unopened gumball-machine prizes—a blue airplane and a pink shoe. The piece admonishes the helicopter parents of this generation generally, but can also be read from the more nuanced angle of gender politics. 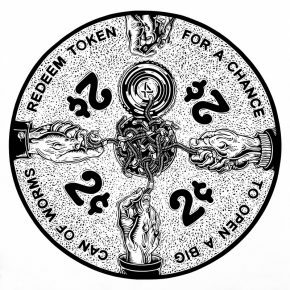 His print “A Party Favor,” in which the donkey and elephant of the two dominant political parties are joined at the hip, ready to collapse together at the push of a button, has been exhibited previously (the first time we reviewed it was in 2008), but it takes on new relevance in this election cycle, in which voter dissatisfaction with both parties has propelled two fringe candidates to center stage. A teacher with such a strong graphic style would be hard for emerging artists not to mimic, and “Eye Winker, Tom Tinker,” by former student Holly Hooper, displays a definite influence. Two small rabbits, one holding a spool of thread, look up at a doe-headed housewife who, bent at the hip, seems momentarily dazed. The title comes from a Mother Goose nursery rhyme full of nonsense words, which aptly evokes the look of the worn-out, wind-up mother encircled by the thread of her duties. Hooper is now an art teacher at Wasatch Academy in Mount Pleasant, and one assumes that the markedly different etchings also on display—an unfortunately pedestrian view of a barn but also a delicate examination of a bird’s nest—are more indicative of the style she is pursuing now that she’s out of school. 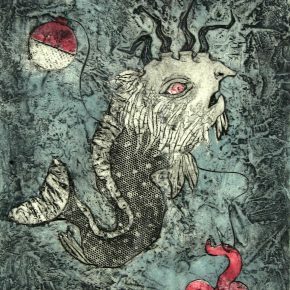 Zane Anderson also studied at Snow College and a title like “Food for Thought” could easily have been lifted out of one of Larsen’s notebooks, but the strange aquatic figure in this piece, and the surreal figures of his “White Noise” and “Tongue and Fly 2,” are more likely indebted to Brian Hoover at SUU, where Anderson finished his education in 2015. To note an influence is by no means meant to dismiss an artist: Hoover and Larsen are both fine artists and one could do worse than be influenced by either. One looks, then, for what direction the artist will take this influence, and Anderson brings to his pieces a lively sense of humor and a narrative flair. 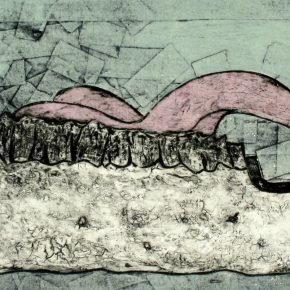 The fat pink tongue reaching out of a bleached jawbone in “Tongue and Fly” will make you both laugh and think twice the next time you come across an old carcass in the hills; and the wheel-drawn head in its counterpart, “Tongue and Fly 2,” creates plenty of narrative intrigue. Abe Kimball, the man responsible for bringing all these artists together, announces some of his influences in the title of his hand-colored lithograph “Ovis Aries, after Zurburan and Van Gogh.” He borrows a sacrificial lamb from the Spanish artist and a starry sky from the Dutch, but there’s also something about the vertical format and the tablecloth that calls to mind a more local artist: Ron Richmond. This association is abetted in no small part by the inclusion of three of Richmond’s prints, hung next to Kimball’s work. Two are versions of Richmond’s recurring “Robe” motif—a pile of folded cloth hanging off a table—executed through different techniques, the hand-tinted drypoint coming much closer than the woodblock to mimicking the ethereal light of the artist’s paintings. It doesn’t take much to see Kimball’s lamb in the place of the robe. All artists borrow, and every artist is in conversation with others, and it may be no less interesting if that happens with someone down the street rather than across the world; and when our fetish for “originality” persuades us to dismiss artists working in a similar vein, we deprive ourselves the pleasure of enjoying the nuanced differences and similarities that arise in these conversations. For the viewer looking for them, the exhibit offers other connections. Animal motifs abound and overlap in this exhibition of rural artists. Karin Jones shares Bennion’s love of horses. In a 1961 lithograph (when she was Karin Nelson), a light horse and a dark horse prance about in a wooded scene where the encircling branches mimic the swishing tails and curved bodies of the two “Companions.” An even earlier woodcut (1957) shows a much more graphic approach to the subject, with long negative lines carving out the equine figure. Kimball also celebrates the equine in his “Kanthanka,” where Siddhartha’s favorite horse is represented by four variously colored lithographs of a horse’s skull against a Pop-inspired background. Look across the room and the jawbone of Anderson’s “Tongue and Fly” might easily fit into these skulls. But these are more coincidences than relationships of consequence and certainly not all the artists on display fit neatly into a narrative of influence. Robert De Groff’s masterful etchings and mezzotints call to mind the magical age of bookmaking, when delicately rendered prints like these illustrated books printed on luxurious linen paper, and his steam punk aesthetic that blend past and future. In “Insulae Parvae” a man on the shore frames the view of the island of the title, a large spiraling structure not unlike Brueghel’s Tower of Babel, but made of concrete that is falling apart, so that it feels like both an ancient and a contemporary ruin. “Lighter than Air” blends elements of Egyptian or Arabian fantasies with a futuristic feel, as if we are witnessing the mysterious building project from some Jules Verne novel. 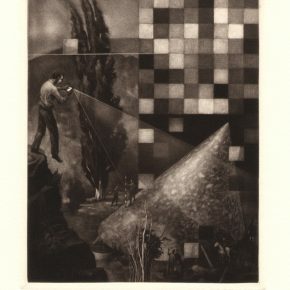 “Cone of Vision” does something similar, though closer to home, where a mysterious object is being investigated by men in contemporary western clothes against the backdrop of the type of Lombardy poplar that dots the central Utah landscape that De Groff calls home. The entire exhibit has a pervading sense of home, of the rootedness of place and the call of the local. That call continues to be felt by many Utah artists, who flock to Spring City and the surrounding communities. They are places to work with few distractions, but as this exhibit demonstrates, the artistic conversations can still be plentiful. And fruitful. 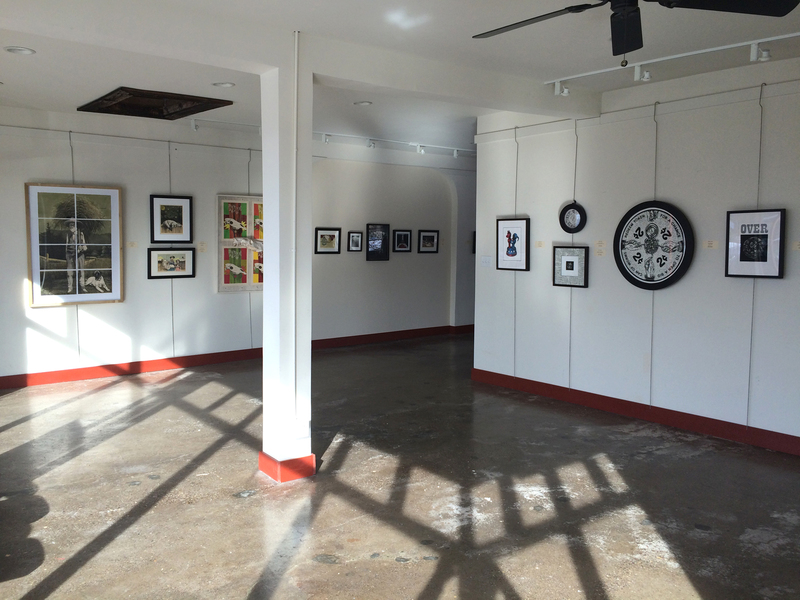 The exhibit is the first in Spring City Arts newest gallery, a space formerly used by Douglas Fryer as a studio and which is adjacent to their current gallery in the Strates Garage building at 79 S. Main, through March 11.